Anatomy of a Murder was the book that gave John Voelker prominence as a writer. It was the fifth book that he wrote, but the fourth to be published (after Troubleshooter, 1943, Danny and the Boys, 1951, and Small Town D.A., 1954). It was the first of his books to make the best-seller lists across the country. John Voelker was born in Ishpeming, Michigan on June 29, 1903. He claimed to have written his first story, titled “Alone All Night with a Bear in a Swamp,” at age ten, and he always added that after that title all he needed to do was add the “woof!” He began developing his skill as a writer during his years at Ishpeming High School and further honed them at the Northern State Normal School (now Northern Michigan University) under the instruction of A. Bess Clark and James Cloyd Bowman. Following graduation from the University of Michigan Law School in 1928, Voelker began practicing law, first in Marquette with the firm of Eldridge and Eldridge, then in Chicago for three years with Mayer, Meyer, Austrain and Platt, before establishing his own practice in Ishpeming in 1933. Following graduation from law school, Voelker served briefly as an assistant prosecuting attorney while with Eldridge and Eldridge, and he was elected prosecuting attorney of Marquette County in 1934. He served from 1935 through 1942 and again from 1945 through 1950. He served as Ishpeming city attorney in 1943 and 1944. Throughout his years as prosecuting attorney he also maintained a private practice. After his defeat by Edmund Thomas of Ishpeming in the 1950 election, he returned to full-time private practice. 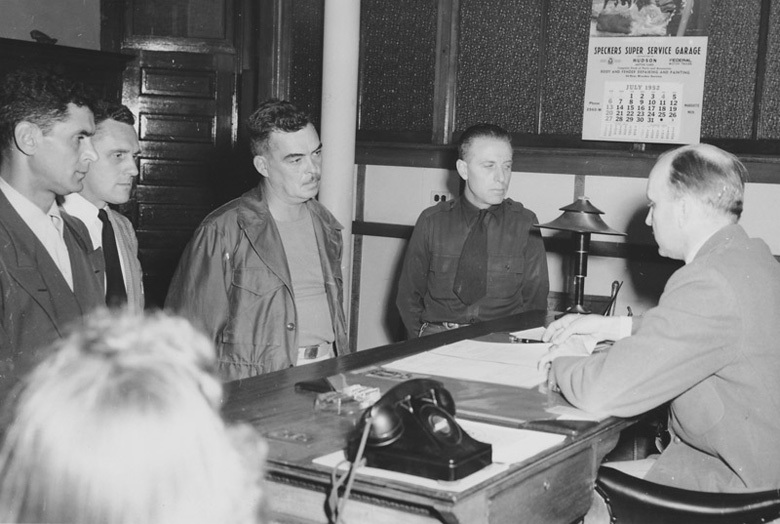 In 1952 Voelker was asked to defend Army Lt. Coleman Peterson, who was accused of the murder of Mike Chenoweth, owner of the Lumberjack Tavern in Big Bay. After a six-day trial the jury returned a verdict of not guilty by reason of temporary insanity. Voelker turned over the events of the trial in his mind, and in 1953 he began tinkering with the idea of writing a novel based on the trial. He was not able to take the idea very far because he was working on the final draft of Small Town D.A., which was published by Dutton in 1954. Following the publication of Small Town D.A. he devoted all of his writing time to Anatomy of a Murder. By early 1956 he had completed a revised draft of the novel and began sending it to publishers. The publishers were not impressed, and the rejection slips began to pile up. Sherman Baker, his editor at Dutton, had moved to St. Martin’s Press, so he sent the manuscript to Baker. Baker liked what he read, but also realized that the pre-trail portion of the novel was too long and needed to be substantially pruned. In September 1956 he flew to Marquette and spent the weekend with Voelker cutting and refashioning the manuscript so that the trial was the centerpiece of the novel. Voelker then prepared another draft, the third, of the novel for formal submission to St. Martin’s Press. On December 31, 1956 St. Martin’s notified Voelker that they had accepted Anatomy of a Murder for publication. Coincidentally, Governor G. Mennen Williams telephoned that same day to offer John a seat on the Michigan Supreme Court to fill the remainder of a vacant term. Mr. Justice Voelker was sworn in as an associate justice several days later. At that time Michigan law required justices to stand for election at the next statewide election following their appointment to an unexpired term, so in addition to his court work and making revisions and corrections to the novel, he had to campaign for his court seat. He was elected by a resounding majority. Publication of Anatomy of a Murder was scheduled for mid-September, 1957. However, the Book-of-the-Month Club chose the novel for one of its alternate selections and requested that publication be postponed until January 1958. St. Martin’s acquiesced, and the book was published in early January 1958. It was an instant success and quickly climbed the best-seller lists, staying there for over a year. St. Martin’s planned to have the book turned into a Broadway play and then a motion picture, and asked John Van Druten to write the play. Van Druten completed a rough draft of the script before he died in December 1957. Eventually Elihu Winer wrote his version of the play, which had its premiere at the Mill Run Theater in the Chicago suburbs in 1963. Meanwhile, St. Martin’s had made the film rights available, and they were finally acquired by Otto Preminger. All of the filming was done in Marquette County, and the film was very successful. Now assured of an adequate income, Voelker resigned from the Michigan Supreme Court in January 1960 to devote his time to fishing and writing. He was quoted as saying, “Others can write my opinions, but no one else can write my books.” Some people would dispute that as his opinions have been termed the most literate opinions ever to be handed down from the Michigan high court. Trout Madness, that fourth book, was published in 1960 and was followed by Hornstein’s Boy (1961), Anatomy of a Fisherman with photos by Robert Kelley (1964), Laughing Whitefish (1965), The Jealous Mistress (1967), Trout Magic (1974), and People Versus Kirk (1981). He also wrote several articles, mostly essays on fishing, and, for a brief time, a column in the Detroit News Sunday Magazine. He died in 1991. Copyright 2008 by the NMU Board of Trustees. NMU is an equal opportunity institution.